It would have been 77 years. Seventy-seven years ago this weekend, my grandparents got married. They’d known each other since childhood. My grandfather died in July, 2001. My grandmother in August 2005. All my children remember of my grandfather, Daddy Joe, is visiting him at Milford Manor. The remember him as sick and dying. They have different memories of my grandmother – Nana, as we called her. But even those memories are of assisted living facilities. They remember her hugs and her love, despite the fact that she didn’t always know their names or exactly whose they were. I used to take photos of the boys when I’d go visit alone. I’d write their names and ages on the back and that they were my sons. She always thanked me for that, though it didn’t seem to have much impact on her remembering. But maybe she knew when she looked at the photos, alone in her room with all the other photos of her children, grandchildren and great-grandchildren. I really don’t know. I visited fairly often. And I regularly took the boys. We’d listen to my grandmother play the piano in the living room for all the other residents. She played beautifully and remembered all the notes. What she didn’t remember as she started a song was that she’d just played that song. So we’d listen to the same music over and over and over. It’s easy to remember the end. I prefer to remember the earlier days. Playing in their backyard when we were little. Running up and down the big hill. (really, not so big.) Playing hide-and-seek with my cousins when we’d go for holidays. One time, David turned the water on in the shower downstairs when I was hiding in there. Yup. I remember that. We’d hide in Aunt Phyllis’ closet – it took up the whole wall and there was a space between the two sets of doors where you could hide out for hours. We’d play with the poker chips, though we didn’t know how to play poker. I loved the case for the chips – not sure why. But I have a love of the game now and maybe it stems from those days. We’d look through the 45’s and play records. We’d critique the paintings in the back room where my mother and her sisters would come for art lessons along with my grandparents every week. I loved the smell of the turpentine. Still do. There was a great hiding place in that room, too, in the metal cabinet. Thinking back, we must have been pretty little! 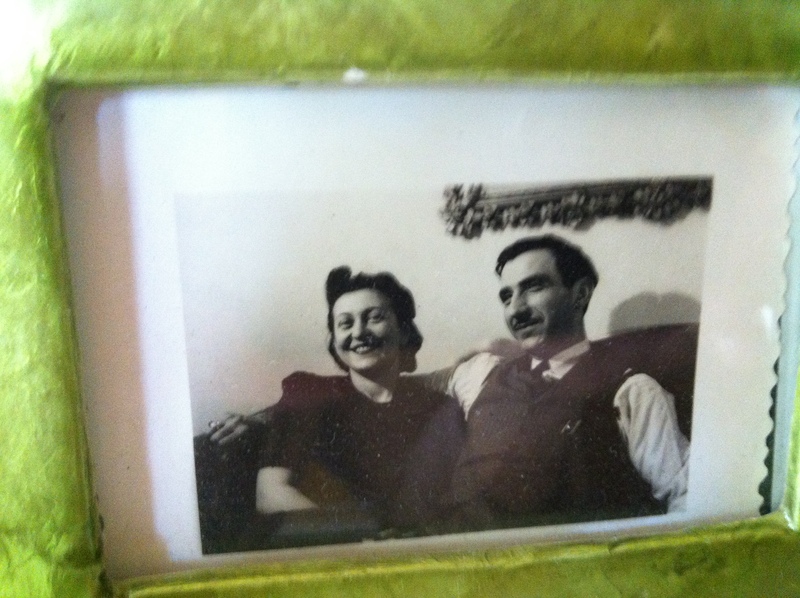 My great-grandfather hid the afikomen in the same place every Passover – under the tablecloth in front of him. When my grandfather took over the job, it seemed the afikomen was always in the piano bench. I’m thinking my creativity may not have come from them. <grin> The seders were long. Long. As a kid, I remember wishing they would end so we could eat. Now, I wish we could have all those people together for a holiday again. I know that my appreciation for having family and a big group for the holidays came from my childhood. It’s just how it was. Holidays are for sharing, for being together. I do see my cousins. More on Facebook than in person, but I see them. And there’s a huge family reunion coming up soon which extends a much wider net – all of the descendants of my great-grandmother’s parents. My children have never met some of these people. Actually, a lot of them. As our lives seem to take us farther away and further apart, I crave being closer and more connected. For me. For my children. I know that social networking is helping to make that happen. And that it’s time – at least for me – to reverse the trend. What a lovely post. Only Finley got to know my Nana and only for a short while. I have very similary memories of my Nana’s house and the smelles from the kitchen. Thanks for sharing! Thanks for commenting. We’re lucky to have nice memories! I remember those good times too. Now we’re making new good times for your children to remember. Thanks for reminiscing! We are making new memories!